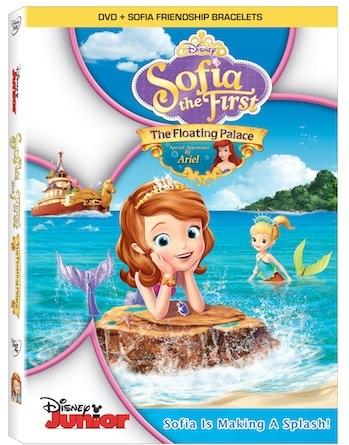 She's making waves and exploring the water world in SOFIA THE FIRST: THE FLOATING PALACE on Disney DVD April 8th! Witness her transform into a mermaid to help save her new mermaid friends from danger and be on the look out for Princess Ariel's cameo. The DVD includes three bonus episodes and FREE exclusive friendship bracelets! Do YOU believe in mermaids? You will – when you set sail on a magical full-length adventure under the sea with Sofia the First! After Sofia helps a young mermaid named Oona, Sofia’s amulet grants her the power to transform into a mermaid and visit her new friend’s secret underwater kingdom. But when Cedric (disguised as a sea monster) plots to steal Oona’s enchanted Mermaid Comb, danger surfaces for both worlds. With a little help from special guest, Princess Ariel, Sofia embarks on an adventure to rescue Oona. Overflowing with oceans of song-filled fun – plus three more exciting episodes – Sofia the First: The Floating Palace proves that when families and friends work together, they can weather any storm and save the day!